Crude oil prices extended their fall printing a new 20-day low at $70.5 a barrel. The risk-off mood continued to weigh down on oil as the trade war between Washington and Beijing is escalating more and more with President Trump issuing more threats by saying “Chinese lived too well for too long. Our policies hurt China’s economy, and I have a lot more to do” during an interview with FOX News. On top of that, commercial crude oil inventories increased by 6M barrel from last week where as the forecasts were expecting an increase by 2.3M barrel, putting more pressure on the prices. 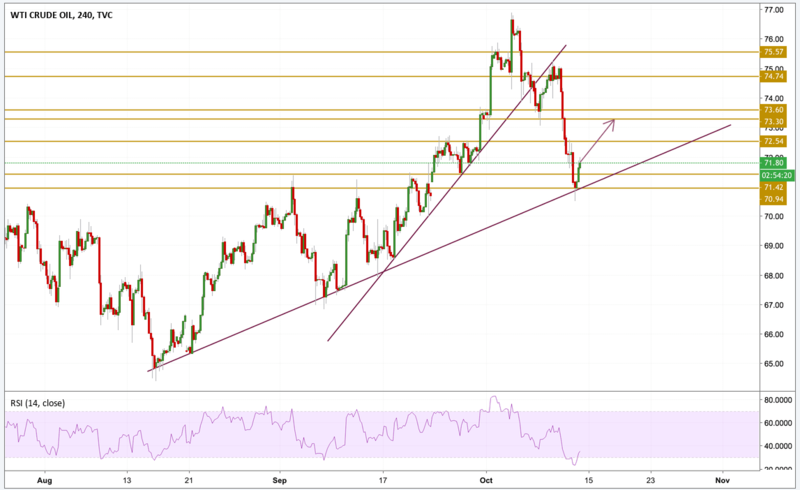 After hitting a new 20-day low at $70.5, Crude oil prices are set for a correction as thy're gaining traction again on the 4H chart after entering into oversold state. The price has also reached the second longer purple trend line where it bounced off from. The next level we will be focusing on is the $73.3 resistance level.